A woman's hair has always been regarded as her crowning glory: from the elaborately dressed styles in Ancient Greece to the simple bobs of the 1920s and the colorful gelled spikes of Punk, right up to the latest directions in the world of hairdressing today. Straight or curly, long or short, blonde or dark, hair offers women the ability to change their appearance dramatically - and define their social standing and style allegiance. 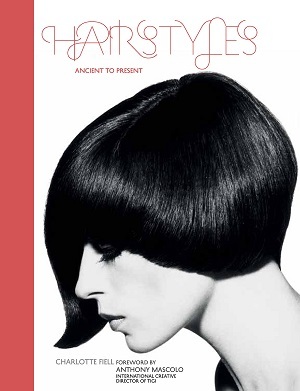 "Hairstyles: Ancient to Present" seeks to celebrate the complex art of hairdressing from its earliest known beginnings to the most modern and contemporary of styles. Featuring over 1000 illustrations and photographs, including astonishingly ornate eighteenth century powdered wigs bedecked with ostrich feathers, flowers and jewels; photography of glamorous 1940s film stars and their carefully waved and dressed hair; advertisements for hair treatments and products going back to the eighteenth century; and the poker straight lengths so fashionable in the 1990s. "Hairstyles" also celebrates the famous names behind the styles - Mademoiselle Julienne (whose elaborate coiffure of 1778 involved a scale model of a ship) receives plaudits, as do Vidal Sassoon, Leonard of Mayfair, Raymond Bessone, and modern day salons and stylists such as TONI&GUY, Gianni Scumaci, Antoinette Beenders, and Eugene Souleiman. There is nothing we love to change more than our hair - "Hairstyles: Ancient to Present" is not only a stunning documentation of the history of styling, but a unique inspiration.